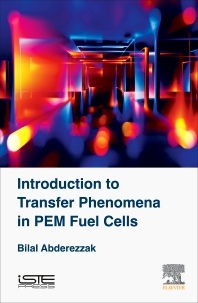 Introduction to Transfer Phenomena in PEM Fuel Cells presents the fruit of several years of research in the area of fuel cells. The book illustrates the transfer phenomena occurring inside a single cell and describes the technology field of hydrogen, explicitly the production, storage and risk management of hydrogen as an energy carrier. Several applications of hydrogen are also cited, and special interest is dedicated to the PEM Fuel Cell. Mass, charge and heat transfer phenomena are also discussed in this great resource that includes explanations, illustrations and governing equations for each section. Bilal Adberezzak is a doctor of Sciences; he is working as an associate professor and researcher at the University of Khemis Miliana in Algeria. He followed a scientific career dealing with the advanced energy systems related to the Green and renewable energy sources.